This morning, my addiction to nicotine had me entertaining sick thoughts. My addiction tried to make me believe that since I didn't plan a quit date and made an impromptu decision to quit that I have somehow cheated myself out of truly getting to enjoy my last few packs of cigarettes. I do know that this is STINKING THINKING and I haven't been cheated out of a darn thing.Just goes to show how ugly and tricky addiction is. Today is the first day I left my house since I came home last Friday evening. I was scared to drive (a trigger). I just had to get out today to take care of some errands that I had been putting off. I found 2 packs of unopened cigarettes in the glove compartment and tossed them into the garbage can on my way inside the store. I did contemplate smoking one since I had gotten cheated out of some enjoyment. I KNEW BETTER. I was a success! As a smoker, I would reward myself with a smoke each time I got back into the car to head to my next destination. Today, I sang really loud in the car and drank a lot of cold water. Like you, I stopped smoking very abruptly. One day at the beginning of my quit, I had that same fleeting thought that you did. Like you, I pushed past it. Now I'm 80 Days Free. I'm looking forward to watching you stack your days. You've already proven that you are stronger than this addiction we share. So glad you're learning to deal with the strongest triggers. 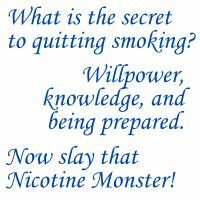 Quitting smoking is a learning experience that doesn't stop when we actually quit. The thing is, we can be ready for the worst, but until we're actually experiencing what a quit is really like for us, we still have to learn, which you are doing. CONGRATULATIONS on winning the war with yourself today! SO proud of you!! It's easy to rationalize ourselves back into a bad habit. Just know that you are not alone in that and although we're not physically standing beside you, we ARE here for you and totally understand the stink stix thinking. Give yourself a big huge hug for making a great choice today! I also abruptly quit; I had a quit day planned, but just suddenly decided to push it up by 12 days. I've also dealt with that idea of rewarding myself with a cigarette and also the idea of having been cheated out of smokes. It IS crazy what we'll think kicking this addiction. You did great throwing those packs away! This is only my 9th dof, but it's feeling good. Keep on going! SO much good advice and support here at Ex. SO glad your doing this! YAY!!! Kimshine What a great EXample you are to everyone. I KNEW I could not smoke again because I had gotten SO SICK, I also knew that my addiction would pull anything it could to get me back. Once I completely accepted that smoking did nothing FOR me...seriously NOTHING, it really did become easier. I won't say it was easy, it wasn't but it got easiER and I have had many challenges that would have had me lighting up one right after the other...you will be surprised at the things you will find out about yourself...your self confidence will go up and you will feel stronger every smoke free day that you put behind you. Being a smoker is certainly one sided. I allowed myself to do a lot of financial investing, a lot of time investment, a lot of roulette with my health and a lot of stinky hair and clothes and that S-O-B only gave me an addiction for my loyalty. What a joke! I would have never allowed any person in my life to give me so little! Kimshine Great quititude! Let me tell you that MY mirror is not my best friend...some days I am so shocked that I literally back away! Thanks to all for being in my corner and giving me sound advice! You did great.. Another Day Won. Keep stacking those days. The journey continues. One day at a time. NOPE no matter what. You can do this. Goodnight. Thanks Jackie! I hope you had a great night!